April 9, 1903 -- 800 members of the newly formed janitresses union celebrate a victory in arbitration "waving gingham aprons and mop rags, and beating a tattoo on scrub pails." [Chicago Daily Tribune, April 10, 1903] The women had previously worked for 11 cents an hour until Mrs. Susan Horton, a worker in the Ashland Block at Clark and Randolph (where the Chicago Title and Trust building stands today) organized the union, led a process that formalized demands, and presented them to building managers. After two weeks spent in arbitration, the women were granted an increase of seven cents to 18 cents an hour and straight time for overtime. They would work for eight hours in the day and six hours if work was done at night. Work on Sundays and holidays would count as double overtime. 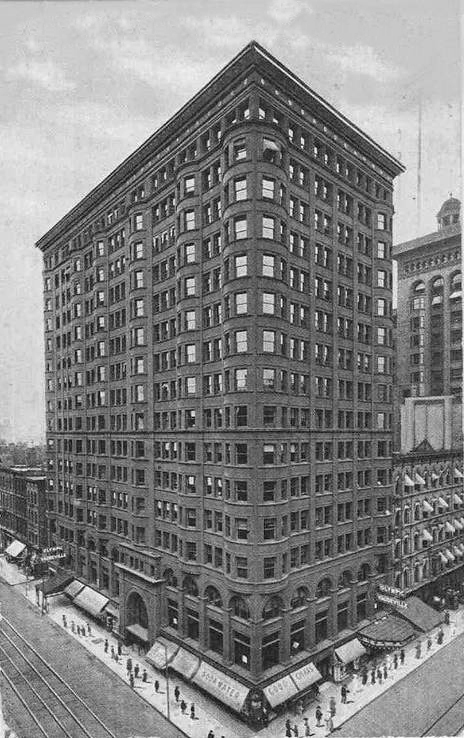 The photo below shows Burnham & Root's Ashland Block, where the whole thing started.